I’m not normally one to lose sleep over missed opportunities; we all make the best decisions we can and life goes on. But in the mid-1990s, I made a truly stupid choice and I’ve been kicking myself for it ever since. I was doing graduate work in linguistics at the University of California, San Diego, and a musical group called Huun-Huur-Tu (or the “Tuvan Throat Singers,” for most of us) came to town and put on a concert at the university. I saw the posters, noticed that my classmates excitedly anticipated the performance, and seriously considered going…but for some unfathomable reason, I decided not to. The next day, and for a week or two afterward, that was all anyone could talk about: this amazing, surreal event—and, for linguistics students in particular, the complex vocal mechanics behind it. It had been, apparently, an almost religious experience for those who went. In the years since, I’ve yet to cross paths with the Tuvan Throat Singers again, and when two different people suggested they might qualify as an Interesting Thing, it was with a certain sense of shame and self-pity that I agreed. What could be so special about a style of singing—don’t all singers use their throats? Not like these folks. The simplest way of explaining what throat singers do is that they can sing two notes at the same time. In fact, not just two notes—some throat singers can produce as many as four distinct tones simultaneously. The effect is truly weird and chilling. The Tuvan Throat Singers hail from Tuva (logically enough), an autonomous Russian republic just north of the Mongolian border and a bit west of Irkutsk. (The capital of Tuva, incidentally, is Kyzyl, which looks and sounds very slightly like “Kissell.” Coincidence? Definitely.) Although Tuvans are the best-known throat singers, similar vocal techniques are used by some Tibetan Buddhist monks, as well as Mongolians and other residents of central Asia; the technique is also known among the Inuit in North America and Siberia. Xhosa-speaking women in southern Africa also practice a form of throat singing. The combinations of notes you hear in throat singing aren’t really chords in the conventional sense; even the best throat singer can’t sing a melody and counterpoint at the same time. Instead, the sound is more like a bagpipe, with a constant-pitched drone under a higher melody with a different timbre. There are in fact several very distinct forms of throat singing. One sounds rather like a digeridoo, with a flute- or whistle-like melody. Others resemble a low growling sound, a bird call, or rolling water, to give just a few examples. But in every case throat singing sounds like it could not possibly be coming from a human being—especially not a single human. Throat singing is closely related to vocal techniques known as overtone singing, harmonic singing, and multiphonic singing. Whether these techniques amount to the same thing, or whether one is considered a subset of another, depends on who you ask; there are no precise, widely agreed-on definitions. But all have in common a way of changing vocal sounds so that multiple distinct tones are perceived at once. Ordinary vocal sounds that are made by vibrating the vocal cords consist of a fundamental tone and a number of higher-pitched harmonics or overtones, faint pitches that are mathematically related to the fundamental and help to determine the overall quality, or timbre, of the sound. Some harmonics are more prominent than others, due to resonances caused by the shape of the throat and mouth; these emphasized harmonics are known as formants. What throat singers do is to select a fundamental pitch at which certain formants will naturally be strongest, and then manipulate their vocal tracts in such a way as to reinforce individual harmonics even further. By careful movements of the jaw, lips, tongue, and throat, they can vary the frequency of the formants, thus affecting which harmonics receive the greatest “kick.” The net result is that you get a steady low-pitched fundamental, but a shifting series of emphasized harmonics forming a melody. If that makes your head spin, it gets even weirder. Your vocal cords (known to linguists as “vocal folds”) are not the only structures in your throat that can vibrate enough to be heard. There’s another pair of tissues slightly higher up in the throat known as the false folds; these, along with various other protrusions of cartilage and tissue, can be manipulated, with practice, to make other pitches in addition to the one produced by the vocal folds. So not only can accomplished throat singers combine a single fundamental with an overtone melody, he can actually create two or three simultaneous fundamentals. I get a sore throat just thinking about it. Although Huun-Huur-Tu is the best-known group of traditional Tuvan Throat Singers, there’s another Tuvan who has taken the art down a different path. 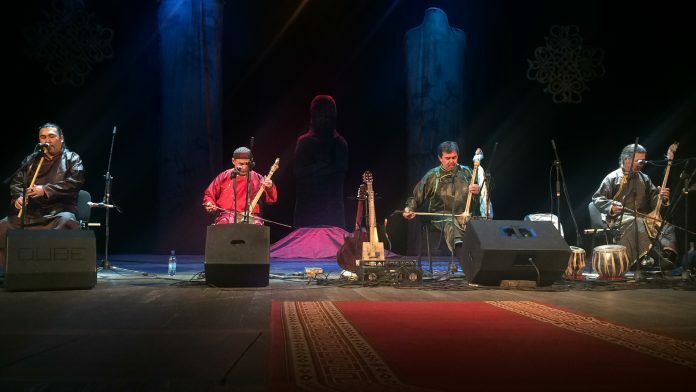 A singer named Kongar-ol Ondar combines Tuvan throat-singing techniques with modern instruments and pop stylings that sound familiar to western ears. While some critics feel he has corrupted a beautiful art form, a more charitable view is that he has helped to make throat singing more accessible and understandable to an audience that would otherwise not accept it. Ondar was featured in the documentary Genghis Blues, and has music available on the usual streaming services—a sure sign of popular acceptance. Scientific research has shown that there’s nothing unique to the anatomy or physiology of Tuvans’ vocal tracts; anyone, given the proper training, can learn throat singing. It is, however, quite challenging, and not likely to win you a lot of votes on America’s Got Talent—seriously, it’s been tried. But there are some things in life that are worth experiencing for their sheer wonder. Note: This is an updated version of an article that originally appeared on Interesting Thing of the Day on July 29, 2003, and again in a slightly revised form on March 14, 2005.